WhatIfSports.com used its college basketball simulation engine to play the NCAA Tournament from the Sweet 16 onward 1,001 times. 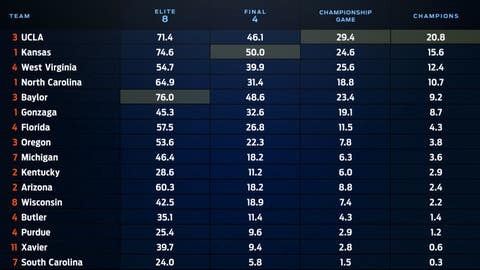 The simulation generated every team’s round-by-round odds of advancing. Check out how the teams in each region fared. 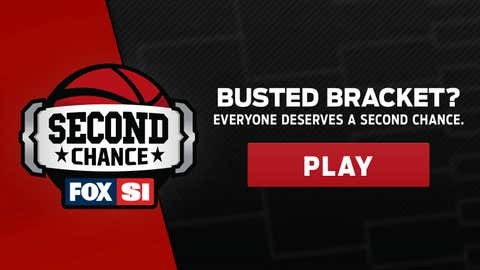 Then create your own bracket in the FOX / SI Second Chance Bracket Challenge to compete for prizes. For the second year in a row, Wisconsin upset a Big East team in the Second Round. Last year, the No. 7 seed Badgers knocked off No. 2 Xavier. This time around, Wisconsin took down the tournament’s No. 1 overall seed and the defending champions, Villanova. The Sweet 16 may again be the end of the line, though. In 1,001 simulations, Florida won 57.5 percent of the time. 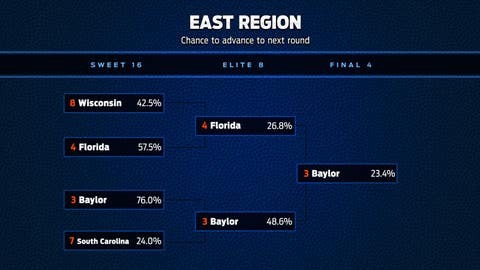 If Wisconsin does make it past Florida, the Badgers have an 18.9 percent chance at a Final Four berth, compared to Florida’s 26.8 percent chance. Surprising early exits from Villanova and Duke have paved the way for an unexpected team to emerge from the East Region. According to WhatIfSports.com’s simulation engine, that team will be Baylor. Coach Scott Drew’s Bears have a 48.6 percent chance to reach the Final Four, the second-highest of any team in the field. Their 9.2 percent title odds rank fifth overall. South Carolina, meanwhile, has the lowest winning percentage in the Sweet 16 round at 24.0 percent. 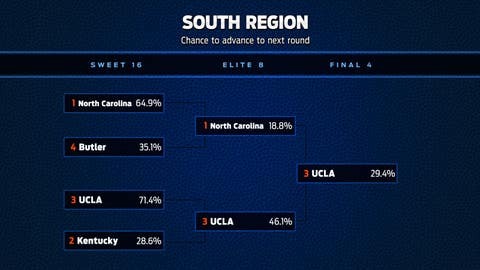 The Gamecocks have just a 0.3 percent chance to win the National Championship. Gonzaga is a perennial tournament team with 19 straight appearances, tied with Wisconsin for the fourth-longest active streak and trailing only Kansas (28), Duke (22) and Michigan State (20). Despite the success, a Final Four trip has eluded the Bulldogs. WhatIfSports places their Final Four odds at 32.6 percent, fifth-best of the remaining teams. However, it could be another disappointing season for the Zags, as West Virginia’s Final Four odds are at 39.9 percent, fourth-best. In the head-to-head, the Mountaineers win 54.7 percent of the time. The Xavier Musketeers, the only double-digit seed left in the tournament, have a decent shot at upsetting Arizona and former XU coach Sean Miller. In 1,001 simulations, Xavier came out on top 39.7 percent of the time. Extending the run much farther looks unlikely, as Xavier’s Final Four odds are just 9.4 percent. The Wildcats aren’t a favorite of the simulation engine either, with their 18.2 percent Final Four odds tied for 10th best. WhatIfSports gives Arizona a 2.4 percent chance at winning the title. The No. 4 seed is the only one to remain intact through the tournament’s first weekend, with Purdue, Butler, Florida and West Virginia all surviving. The end could be near for Purdue, however. The Boilermakers have a 25.4 percent chance of upsetting Kansas and 9.6 percent odds to reach the Final Four. 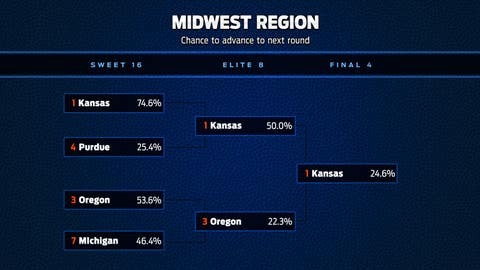 Kansas has the best Final Four odds in the tournament, winning the Midwest Region in 50.0 percent of simulations. The Jayhawks’ 15.6 percent chance to win the championship is the second-highest of all teams. No two Sweet 16 opponents are more evenly-matched than Oregon and Michigan. In head-to-head simulations, the Ducks won 53.6 percent of the time over the red-hot Wolverines. The percentages stay in line in future rounds as well, with Oregon having 22.3 percent odds at the Final Four compared to Michigan’s 18.2 percent, and 3.8 percent championship odds to the Wolverines’ 3.6 percent. Want another shot at perfection? 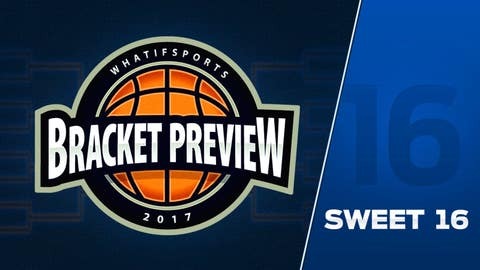 Play FOX / SI Second Chance and compete for prizes by completing the most accurate bracket from the Sweet 16 onward. As the only region with the top four seeds remaining, the South champion will have earned its trip to the Final Four. North Carolina’s redemption tour is alive and well, with the Tar Heels in pursuit of a return trip to the championship game. UNC made it to the title game in 18.8 percent of simulations and cut down the nets 10.7 percent of the time, good enough for the fourth-best championship odds. Butler was less successful, with 9.6 percent Final Four odds and a 1.4 percent chance to win the title. 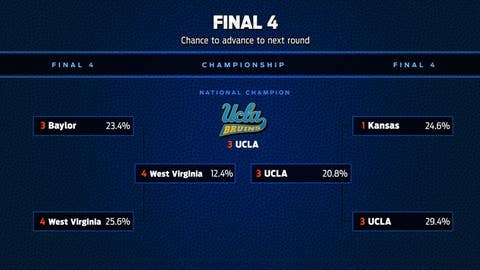 In WhatIfSports.com’s simulation of the NCAA Tournament prior to the opening round, UCLA was pegged as the championship favorite, winning the title in 13.7 percent of simulations. Nothing changed in the first two rounds to diminish the computer’s faith in the Bruins. Lonzo Ball and co. take down Kentucky 71.4 percent of the time and reach the Final Four in 46.1 percent of simulations. UCLA’s championship odds now sit at 20.8 percent. Kentucky’s outlook is considerably less rosy, with an 11.2 percent chance to reach the Final Four and 2.9 percent title odds. In 1,001 simulations, UCLA reached the title game 29.4 percent of the time and won the championship 20.8 percent of the time. Kansas was title-bound in 24.6 percent of simulations and won it all at a 15.6 percent clip. 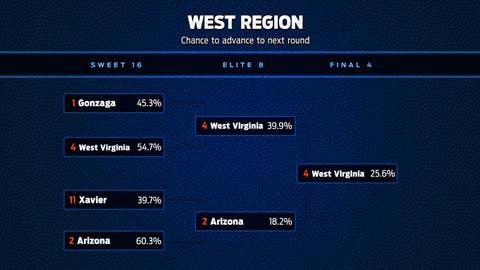 West Virginia was the most common team to reach the championship among East and West Region participants, doing so in 25.6 percent of simulations. The Mountaineers won it all 12.4 percent of the time. Baylor’s odds to reach the championship are 23.4 percent, with a 9.2 percent chance to be crowned champions. View every Sweet 16 team’s round-by-round odds to advance. The best odds in each round are highlighted gray.